Campus Kitchen at Southern Illinois University Edwardsville performs community service by donating food to those in need. However, it is in need of public support to purchase items required for food preparation and more. 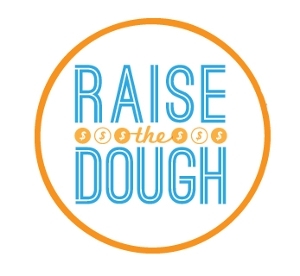 Campus Kitchen at SIUE will begin its second annual Raise the Dough fundraiser on Friday, Feb. 19. Support the Campus Kitchen at SIUE through Friday, Feb. 26. The University is competing with 21 other Campus Kitchens throughout the U.S. to see which campus can “raise the most dough.” The Campus Kitchen at SIUE relies solely on monetary and in-kind donations to continue fighting hunger in the St. Louis Metro area. “We hope to surpass last’s goal of $1,000,” said Allison Menchak, Community Engagement graduate assistant with SIUE’s Kimmel Student Involvement Center. The fundraiser will be done predominantly through social media and online, she added. The money will be used to buy such items as sanitizer, detergent, towels, hair nets, cooking utensils, food containers and more. The annual cost to operate Campus Kitchen at SIUE is approximately $7,700 a year, according to Menchak. For more information, contact Sarah Laux, assistant director of Community Engagement in SIUE’s Kimmel Student Involvement Center at slaux@siue.edu. Campus Kitchen at SIUE began in September 2014. It partners with the Campus Kitchen Project national organization for the objective of cultivating leaders to develop local remedies in addressing the need of hunger and nutritional necessities of those in need. SIUE receives donations from food leftover from SIUE Dining Services, produce from LaVista Community Supported Agriculture Farm in Godfrey and A Little Taste of Heaven Bakery in Edwardsville. 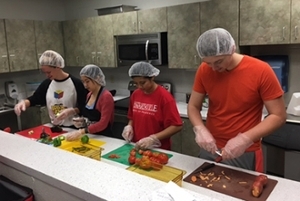 SIUE students work in Campus Kitchen at SIUE to prepare meals to help fight hunger in the St. Louis Metro area.